It says a lot about the war down there when all of them can live side by side provided they are in Turkey but once you get them there they'll cut each other's head off. Theo Padnos is an American journalist. In 2012 he paid local guides in Turkey to cross him into Syria so he could report on the civil war. However during an interview things went bad as the people he thought were his friends turned out to be from al-Qaeda. They thought he was working for the CIA because he spoke perfect Arabic. After almost two years he was released with one hell of a story to tell. THEO WHO LIVED is Padnos's story. He tells us the story and literally walks us through his story often in the places where events occurred. It makes for captivating viewing. I was riveted from start to finish. That said whether you ultimately like the film is going to depend on how you feel about Padnos. He's on screen almost the whole time and how he speaks and acts can work against the film. What I mean by that is he is very earnest in what he is saying. He has a breathy way of speaking and it gives him a cadence that seems very affected. He sounds like he's lecturing more than talking to us. After a while I kind of tired of it. I remained entranced with Padnos's tale, but at the same time I really wish that someone else was telling it. While I like the film, I've recommended it to several friends who write on film, I don't quite love it. At the same time, this is, as I said above, one hell of a tale and is worth your time if you find yourself intrigued at the prospect of hearing Padnos's story. 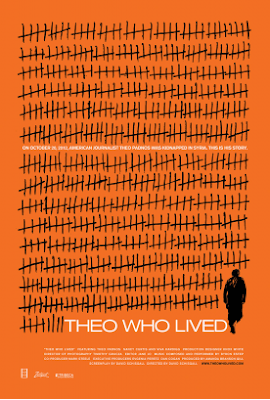 THEO WHO LIVED opens Friday at New York's Lincoln Plaza Cinemas before rolling out across the country.